As America's best-selling coaching text, Successful Coachinghas helped over a million coaches develop their coaching philosophies; improve their communication, teaching, and management skills; and understand their responsibilities as a coach. The updated fourth edition of Successful Coachingoffers students as well as new and veteran coaches a comprehensive guide to every aspect of coaching. 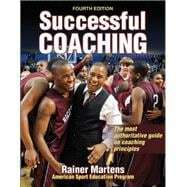 Written by Rainer Martens, a respected and renowned sport pyschologist, longtime coach, and lifelong competitive athlete, Successful Coaching, Fourth Edition, details the principles, knowledge, and skills that will help coaches build a foundation for their decisions and actions. Working through the text, coaches will define their philosophy, identify their objectives, and determine their coaching style. Next, coaches will learn how to become skilled communicators and motivators by applying psychological principles and recommendations for positive management of athletes' behavior. Knowing the skills required for each sport is as important as knowing how to teach and shape those skills. With Successful Coaching, coaches will become more effective instructors as they learn the games approach to teaching technical and tactical skills, a proven method of helping athletes become smart tactical players of their sports. Successful Coachingalso discusses the team management responsibilities of the coach and details how to manage relationships with athletes, other coaches, administrators, medical personnel, officials, parents, and the media. Also addressed are the legal responsibilities of a coach and strategies for reducing risk. Readers will find the latest research in the fields of physical training and nutrition, including new information on creatine, energy drinks, caffeine, and hydration. Successful Coachingalso provides a straightforward discussion of drug abuse among athletes, offering all-new content on methamphetamines, prescription drug abuse, and drug-testing recommendations. Sidebars provide focused insights on a range of coaching topics and offer personal encouragement and advice for coaches throughout the season. In addition, quotes from well-known coaches provide perspective on what it takes to be a successful coach. Reflection questions at the end of each chapter encourage readers to think critically about the content and apply it to their own current or future coaching situations. For course adopters, Successful Coachingalso includes online access to a full set of instructor resources, including an instructor guide, image bank, and test package. A dedicated website also includes customizable and reproducible forms. Access to the electronic forms and additional online resources are referenced throughout the text. Written by a coach for coaches, Successful Coachingblends the latest research and accepted practices in the sport sciences with practical advice from seasoned coaching veterans. Successful Coachinghelps readers think critically about their motivation for being a coach and establish a coaching philosophy and style that pave the way for a fulfilling sport experience for coaches and their athletes. The fourth edition of Successful Coachinghas been carefully revised to meet or exceed the guidelines of the National Council for Accreditation for Coaching Education and the recommendations of the National Standards for Sport Coaches. Successful Coachingis the primary text for the Coaching Principles online or classroom course offered by the American Sport Education Program (ASEP). Coaching Principles is a part of ASEP's Bronze Level coaching certification, a three-step certification involving coursework essential for coaching any sport, teaching sport first aid, and conveying advanced sport-specific knowledge.